Pictured (l-r): Patti Chartrand, Robert Bach, Lorin Gides, Claudia Revenko-Bowen, Linda Benson, and Fred Potter. Claudia Revenko-Bowen has heard it all. “I’ve always wanted to learn a foreign language but…” Some think it is too late for them to learn. Others cite the difficulty of learning independently. Revenko-Bowen now offers folks an opportunity to put those excuses aside. Earlier this year, Claudia Revenko-Bowen opened the Vermont Language Center in downtown Rutand. 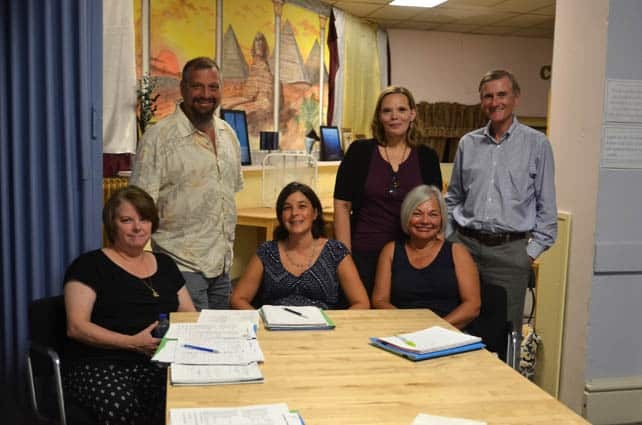 The center offers foreign language instruction for children, teens and adults, and plans to hold events that will offer a place for community members a forum for intercultural awareness and global connectedness. Originally from Argentina, Revenko-Bowen moved to Vermont 15 years ago. In her native country she cofounded a language institution for adults. She has spent time as a corporate translator and teaching ESL (English as a second language) and Spanish. The first session of Spanish 1 has just ended. Upcoming classes for fall and winter will include Spanish, Portuguese and French for adults, after-school Spanish for children, and Spanish support sessions for high school students. Lorin Gides just completed the Spanish 1 course. Learning to speak Spanish “has been a life-long goal of mine, and I dragged my mom along with me,” she explained. Her mother, Linda Benson, said she willingly came, and that it was a great opportunity to exercise her brain and stay sharp. Robert Bach, another adult student, participates in mission trips to South American countries. He said being able to speak Spanish will help him share his religious beliefs and better serve the people he helps while on his trips. Classes at the Vermont Language Center boast small class sizes and feature interactive teaching methods to aid students of all ages in language comprehension. The Vermont Language Center is located at 120 Merchants Row (on the second floor at the Pyramid Holistic Wellness Center) in downtown Rutland. For more information visit www.vermontlanguagecenter.com.